Dr. Erin Mears: The average person touches their face 3-5 times every minute. In between that we’re touching door knobs, water fountains, and each other. With Contagion, acclaimed director Steven Soderbergh moves away from his more obscure arthouse fair and back into more mainstream film territory. 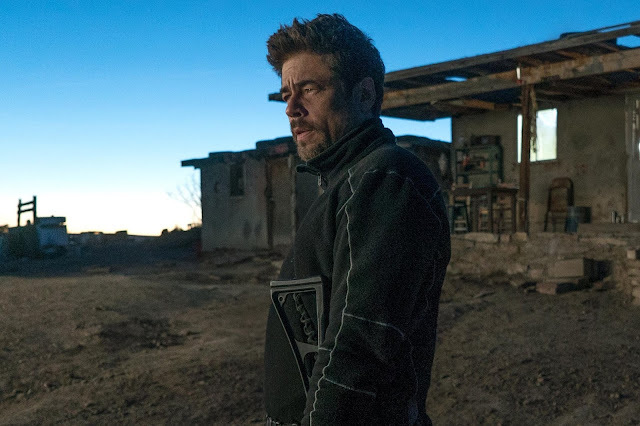 The result is a procedural-style thriller geared towards adults and it is plenty effective in having the surrounding audience be weary of anyone who coughs near them after having seen the film. Using a similar template as he did with Traffic, Soderbergh has taken away the sensationalizing of a thriller based around a global virus pandemic and focuses on a core set of characters “realistically” doing what they can, given the situation they are in. 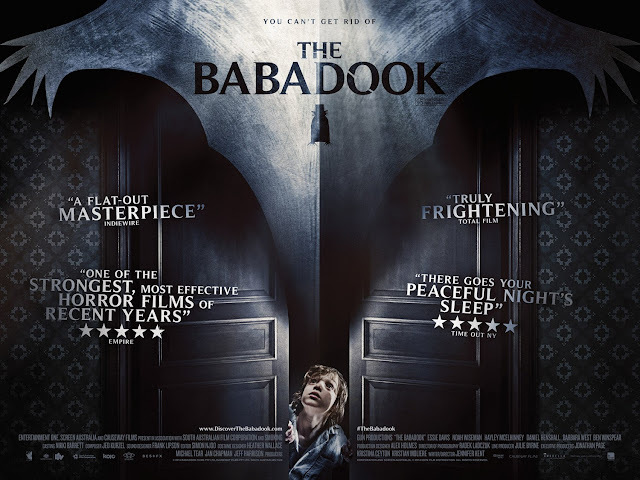 As a result, while not without some characterization issues, the film is absorbing, well made and acted for certain, and quite chilling at times. The film begins with Beth Emhoff (Gwyneth Paltrow), who is on her way back from a business trip to Hong Kong. The first thing we hear is her coughing, followed by a subtitle stating “Day 2,” which sets up intrigue and puts the plot in motion. We soon see Beth, as well as two others around the globe, become very ill, resulting in their eventual death. This is hardly a spoiler, as the second Beth returns to her husband, Mitch (Matt Damon), it would appear she’s doomed, given her look. Beth is essentially labeled as patient zero, as her illness quickly becomes categorized as the result of a deadly virus from mysterious unknown origins. In dealing with the fallout spreading from Beth, we begin to follow several different characters. Mitch and his daughter become one of the groups we follow in this story; with Mitch learning that he is immune to the effects of the virus. Dr. Ellis Cheever (Lawrence Fishburne) of the CDC (Center for Disease Control and Prevention) leads the investigation, with Dr. Erin Mears (Kate Winslet) serving as an onsite investigator, helping to determine how to take action in one of the biggest hotspots for this virus’ activity. Marion Cotillard is Dr. Lenora Orantes, who travels to Hong Kong, with hopes of tracing Beth’s steps in order to find an origin point for the virus. Jennifer Ehle is Ally Hextall, a lead scientist, hoping to find a way to facilitate the virus through lab testing. And finally, Jude Law is Alan Krumwiede, a San Francisco based blogger, determined to spread his version of news, based around what the CDC is or is not doing to help the public. We follow all these various individuals as they do what they can to make it through dire times. I really enjoy these types of films that take one central idea and surround it with many different plotlines and characters to follow. It generally makes for an absorbing sort of feature, especially if it is thrilling in nature. I’m not always hip to the idea of calling out other movies, but Soderbergh directed Traffic and produced Syrianna, which were similar by way of drugs and oil politics, and now he and screenwriter Scott Z. Burns have made Contagion. 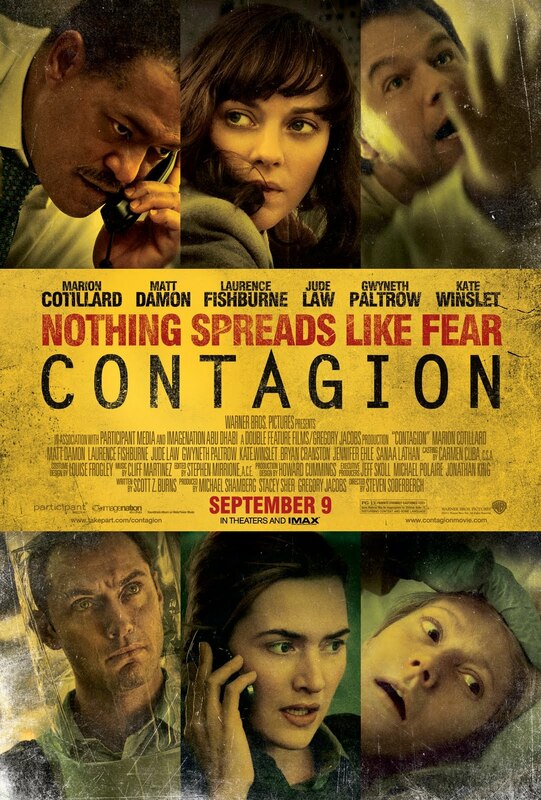 For this film, the idea of walking us through a virus pandemic could easily serve to become a big action thriller, with “gotta-beat-the-clock” type stakes at risk, but it doesn’t, the film takes a procedural approach to the situation, which makes it far more interesting to me. Rather than simply saying to Damon’s character, “we’ll use your blood to make a cure!”, the film realizes the actual kinds of time frames that need to be worked with in order to keep things true to life. 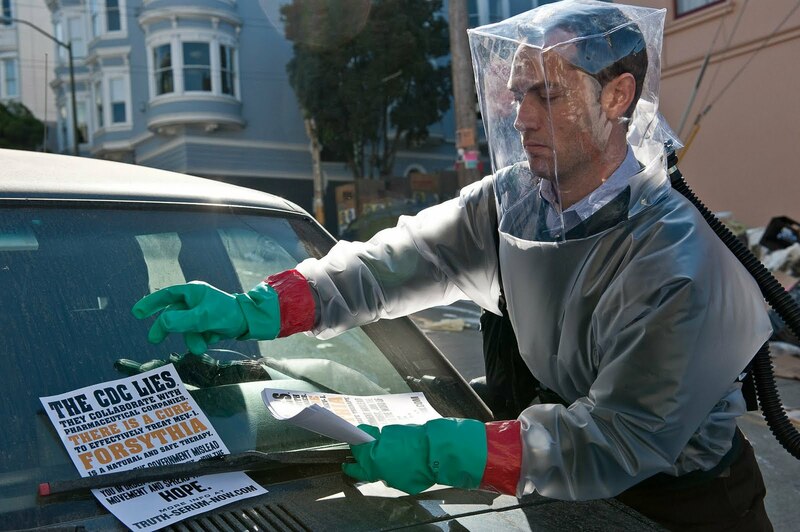 It is always fun seeing ad campaigns for films like this, because Contagion does great work at taking a non-conventional route through standard thriller-type material. The film’s biggest flaw is that it doesn’t give itself much room to breathe. Having all of these characters is not an issue, but keeping each one of them well represented presents a challenge for a 105-minute feature. 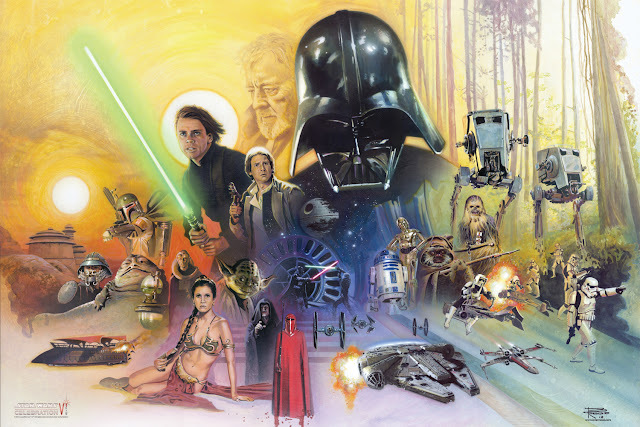 Despite some wonderful performances, which I’ll get to, there is a lack of characterization that does not allow some of the plot strands to have as much punch as they need. In particular, it feels like Cotillard’s story got the short shrift here, as do a few of the other characters. With that said, while the film is all about keeping us informed on the day and the progress made to stop the virus, there are a number of instances where some of the small character moments do ring true, thanks to the caliber of actors present. Damon and his daughter (newcomer Anna Jacoby-Heron) basically serve as the emotional core of the film, with Damon doing a great job of underplaying his role. His look from a civilian point-of-view is quite effective and even leads to a great scene of observation when it comes to seeing how panic has spread in the suburbs where he lives. 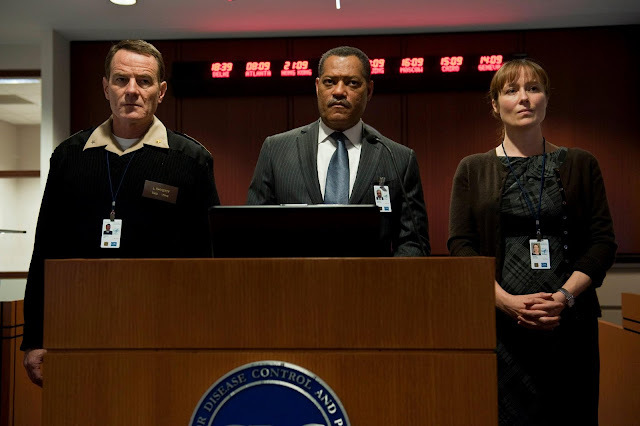 Fishburne gets a fairly meaty role, which works well for the level of authority that he can bring to things and his interactions with others, including Bryan Cranston and Enrico Colantoni are all pretty effective. 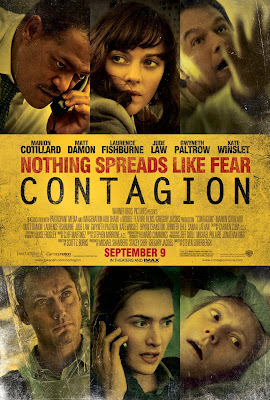 Jude Law gets to play the “largest” character, as he is all talk and contributes a whole other aspect to the term “contagion”, which is quite fitting as the title of this film. The most effective characters, I thought, were Winslet and the lesser known Jennifer Ehle, who, story-wise, contribute a lot, but also manage to do a lot with a little in terms of how to adequately create characters. There are two more aspects of this film I want to go over. The first is how effective this film is at creating its suspense and sense of paranoia through the use of visual storytelling. The way we are shown characters touching, coughing, sneezing, rubbing, and doing other natural/inadvertent actions is incredibly effective. 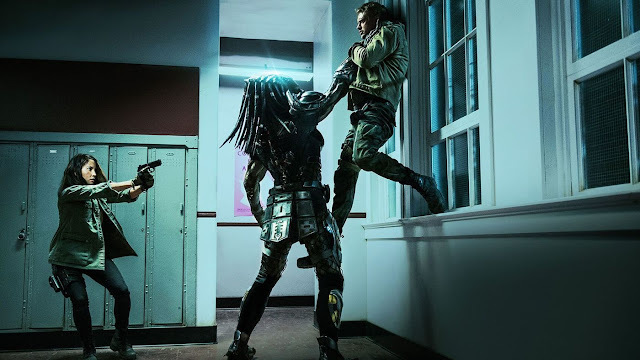 The film does not go overboard with emphasizing the horrors of human contact, or something silly like that, but instead lays out regular-type situations, which happen to be contributing to a much bigger threat this time around. The results are dire and the film does a fine job at communicating this, without going too far into melodrama to get there. The final aspect I want to go over is how great Soderbergh’s direction is in this film. From the fantastic pulsating soundtrack handled by Cliff Martinez to the incredibly efficient cinematography handled by Soderbergh himself, this is a very well assembled film. While I would not have initially thought to want to see this in IMAX, which I still find to be a strange decision for an adult-oriented procedural film, the look of this film and the way that many shots are captured most likely look great in such a large format. As I am curious how much of this film must have been trimmed in order to obtain such a lean running time for the sake of having such a smooth pace, I am curious as to whether a longer running time would have taken away from the urgency in this film. Its tight plot and tense atmosphere certainly benefited, but the possibility of having more of a personal touch could done something more. I much preferred to have seen a story such as this, a world-devastating virus epidemic, be handled as it was here than in another mindless action showcase. As much as I enjoy a fun action romp, I really appreciate the application of multiple plotlines/characters around this main issue. 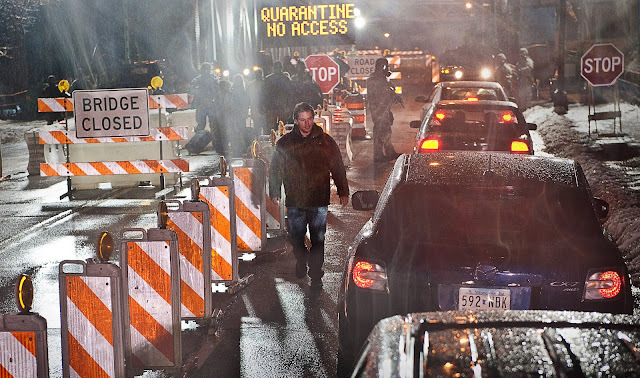 Contagion still manages to establish a great sense of “what if”-type scenarios to create a tense film, with some sequences that are not easy to watch. 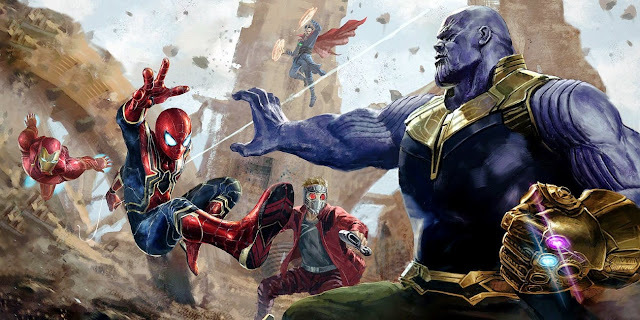 The fact that the film contains smart characters (give or take some choice moments) that realistically try and handle things only served to keep me intrigued in how things would proceed. It also did not hurt that the direction of this film fell well in line with what I have come to expect from a master craftsmen/experimental artist. Dr. Erin Mears: Don’t talk to anyone. Don’t touch anyone. Stay away from other people.